This critically acclaimed recording, was heralded as a milestone in the recorded traditional music of the Oriel region of South Ulster. Long known as Gerry ‘Fiddle’ O'Connor, this is one fiddler whose pulse is quickened by the sheer delight in the tunes. 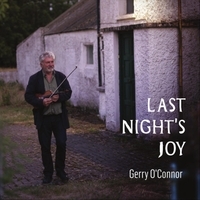 On this his 2nd solo recording, Gerry draws from a wide range of sources, amongst them, County Louth Fiddler Peter McArdle, Quequoise fiddle player Jean Carignan, Swedish nyckelharpa player Erik Sahlström, Belfast fiddler Sean Maguire and Boys of the Lough’s Cathal McConnell amongst others.